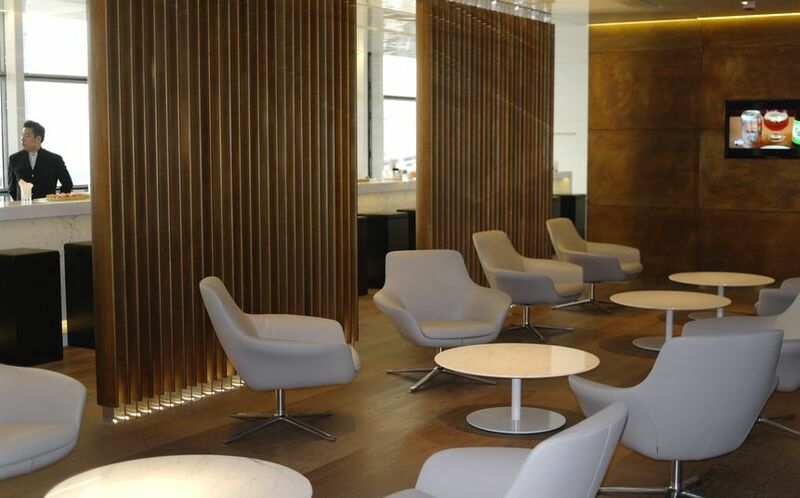 The Bridge, Cathay Pacific's newest lounge at Hong Kong International Airport, is now open. 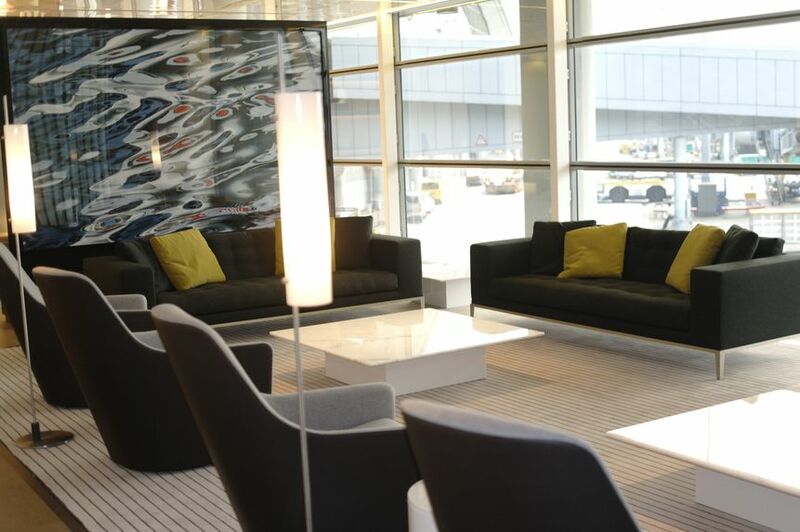 Located near Gate 35 along the airport's West Concourse, The Bridge spans a massive 2,567 square metres – making it only slightly smaller than The Wing Business Class lounge. 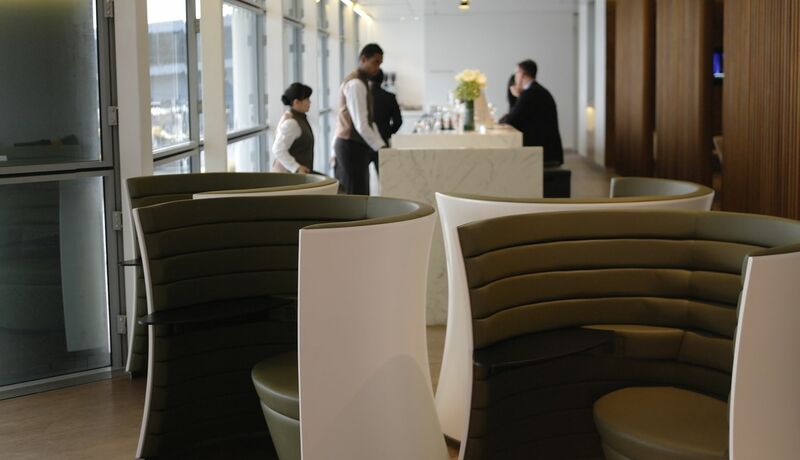 Despite its expansive footprint, The Bridge's vibe is all about "an inviting environment of understated luxury", the airline says. 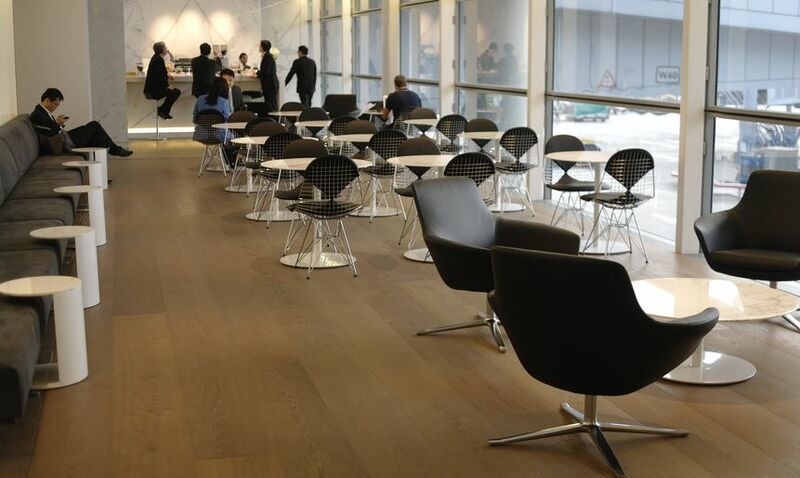 Designed by world-renowned architectural firm Foster + Partners, The Bridge adopts a "more residential design intent" than conventional airport lounges thanks to warm colours, timber flooring and plush (but hard-wearing) carpet. Other 'home' touches include bookshelves. 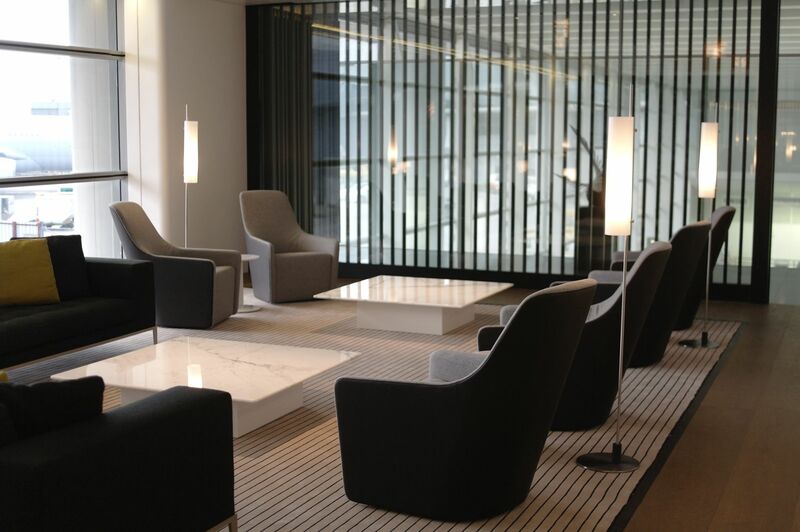 Some of the furniture has guests facing each other, in another nod to a 'living room' environment. This includes some entry areas with long set-back sofas and low coffee tables, although their distance from the sofa makes them more a showpiece than a functional piece of furniture. 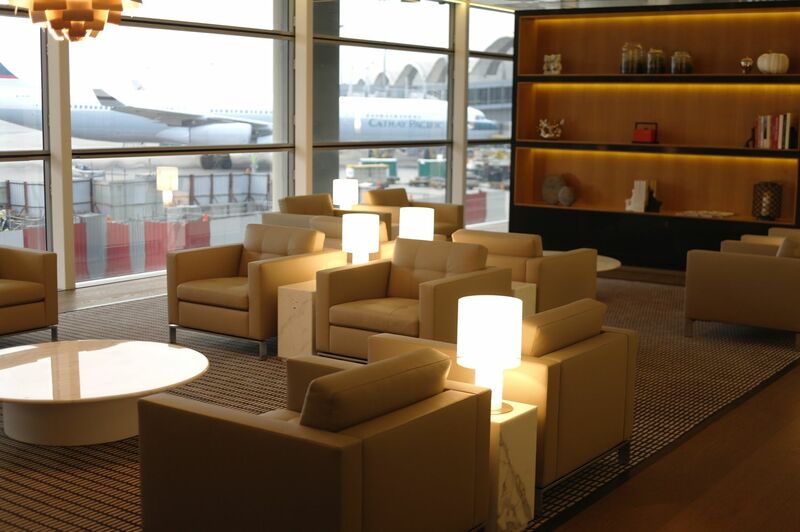 The overall impression is "reminiscent of a living room environment, with natural sunlight filtering through the floor to ceiling windows" Cathay Pacific says, with the aim of making passengers feel not just relaxed but almost 'at home' before their flight. The Bridge is divided into two wings – North and South – each extending from the central reception area, and both beginning with a mirrored 'living room' layout. But each wing also has its own unique features. The centrepiece of The North Wing is The Bakery. This doubles as a dining room but also offers freshly-baked bread and pizzas. 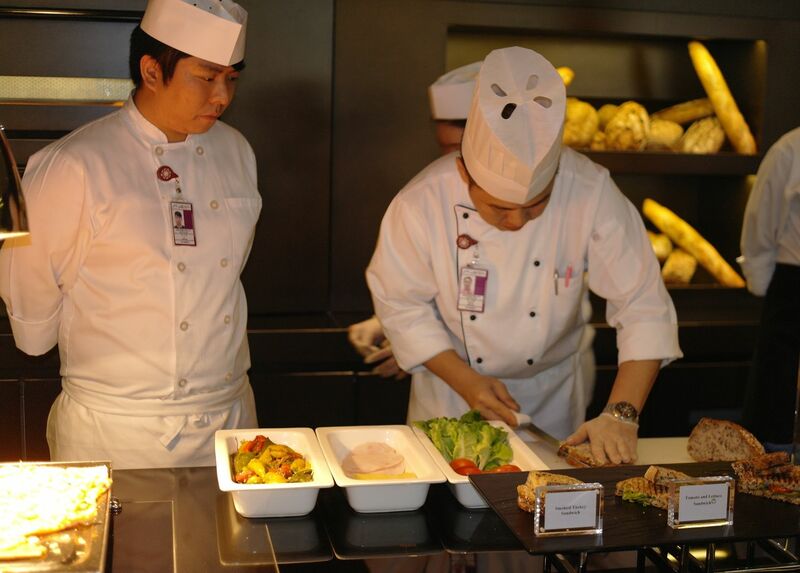 ... along with Asian and Western soups, sandwiches, pastries and salads. 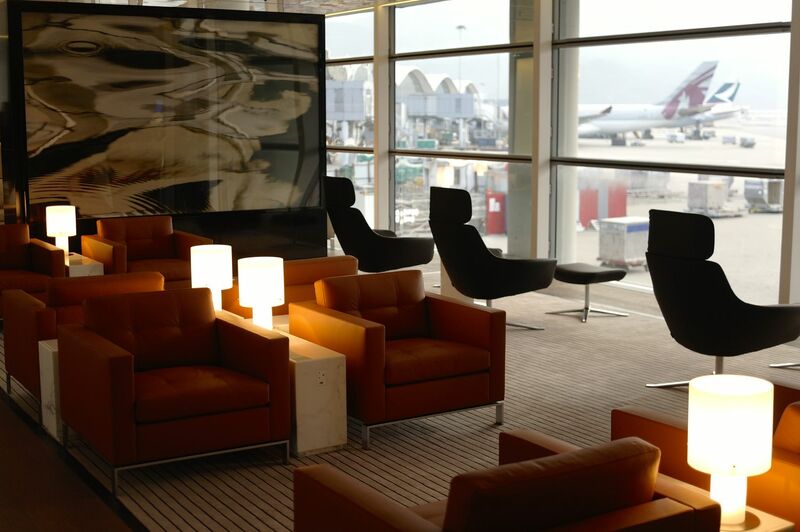 The North Wing also features the airline’s iconic Long Bar. 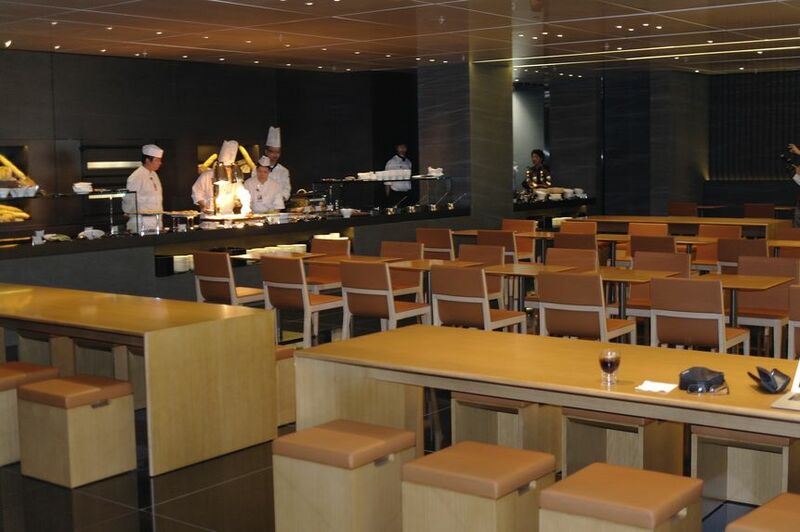 In addition to the usual drinks, The Long Bar offers hot and cold tapas. 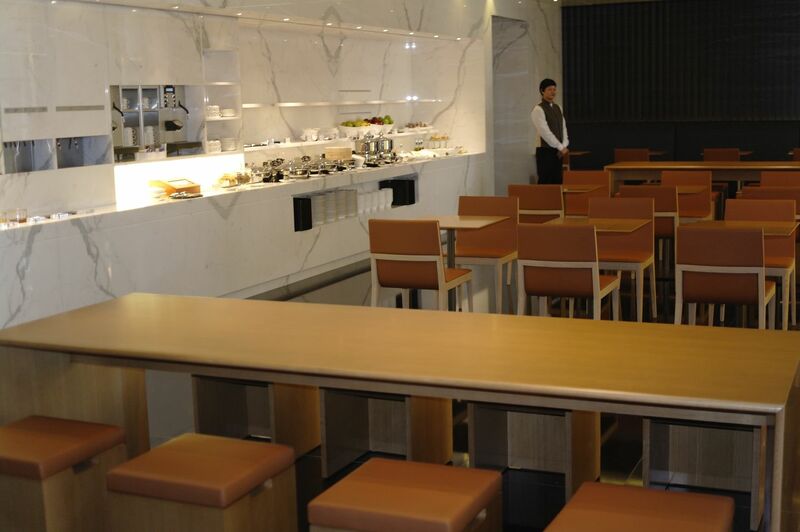 While passengers can sit at the bar and enjoy the view across the airport, there's a Long Bar Lounge directly behind the bar stools. 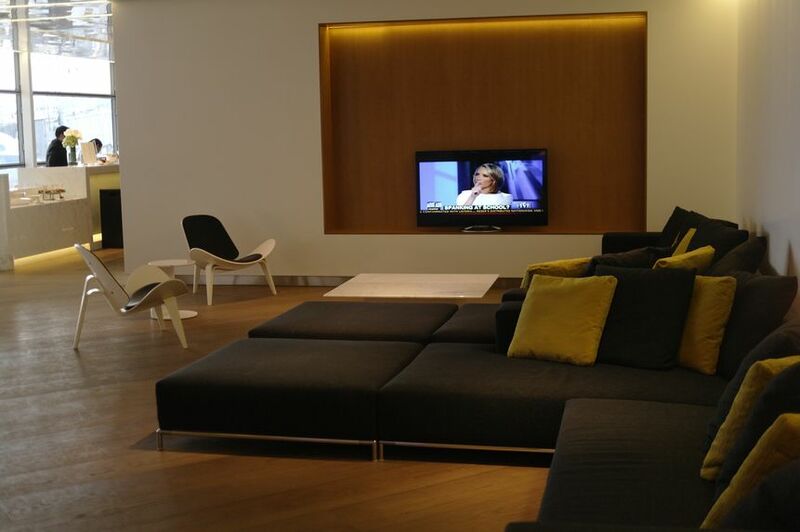 Around the corner is another home-inspired conceit: a television lounge surrounded by, well, lounges. So what's left for The South Wing to claim? Nine shower suites, for one thing. 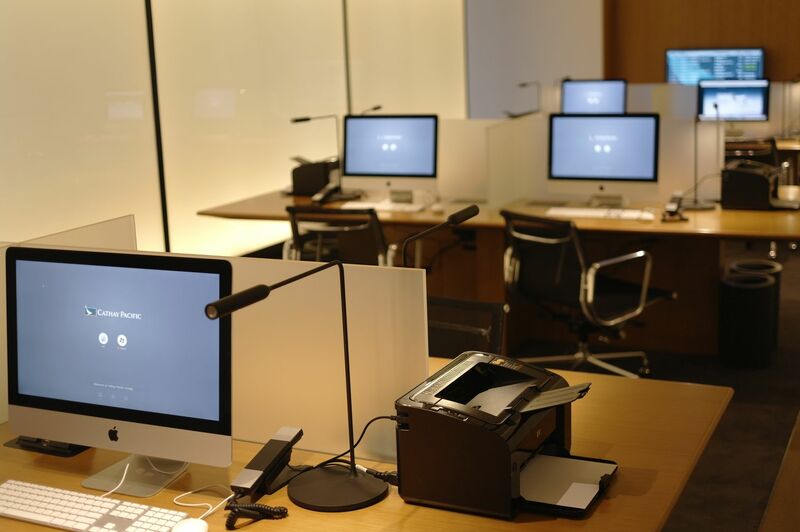 Plus an IT Zone with 12 workstations: six are dual-boot iMacs set up to run both Windows and Mac OS X. 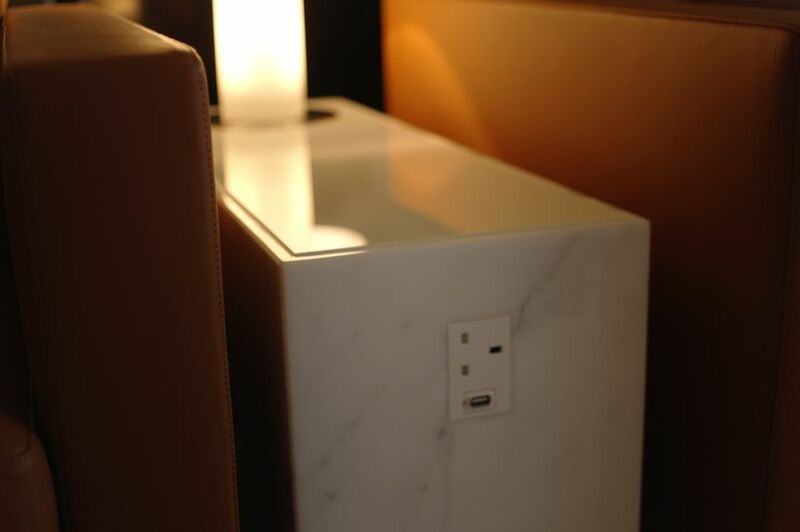 ... with each pop-up power outlet also equipped with a USB socket to recharge your smartphone or tablet. But enough of work! The Bistro is a self-service area where passengers can enjoy a variety of high-quality Asian and Western hot dishes and cold food selections, including delicious desserts and light leafy salads. 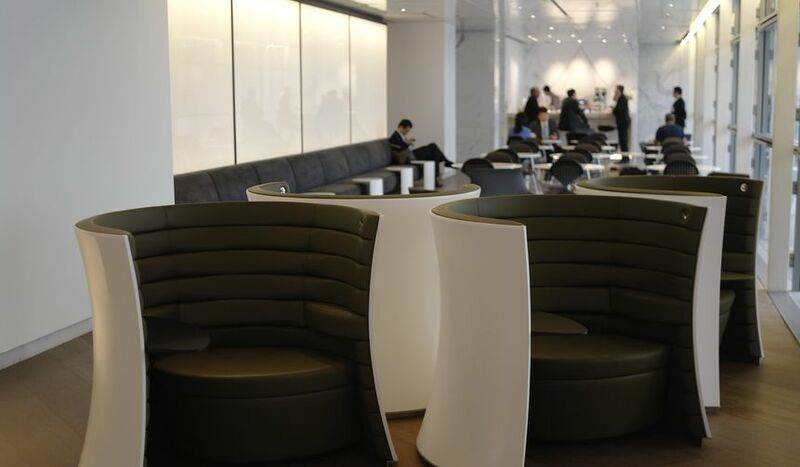 There's also The Coffee Loft, a concept borrowed from The Wing Business Lounge. 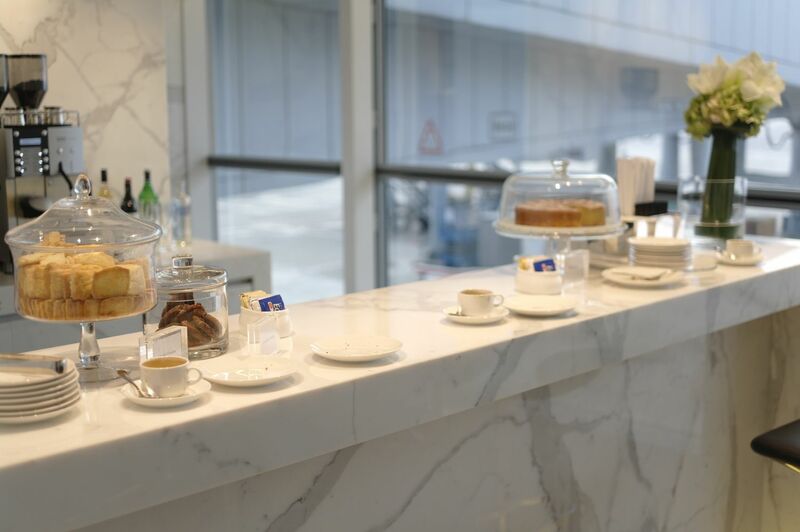 On tap are freshly brewed coffee and specialty tea, accompanied by freshly baked muffins, pastries and cookies. (The butter cookies are highly recommended). 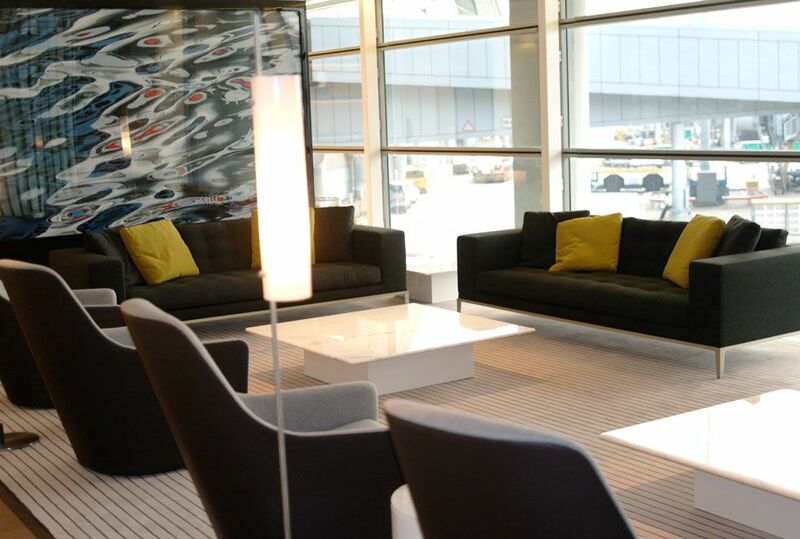 Some other little touches which travellers will appreciate include the addition of USB ports to the AC outlets scattered around the lounge. 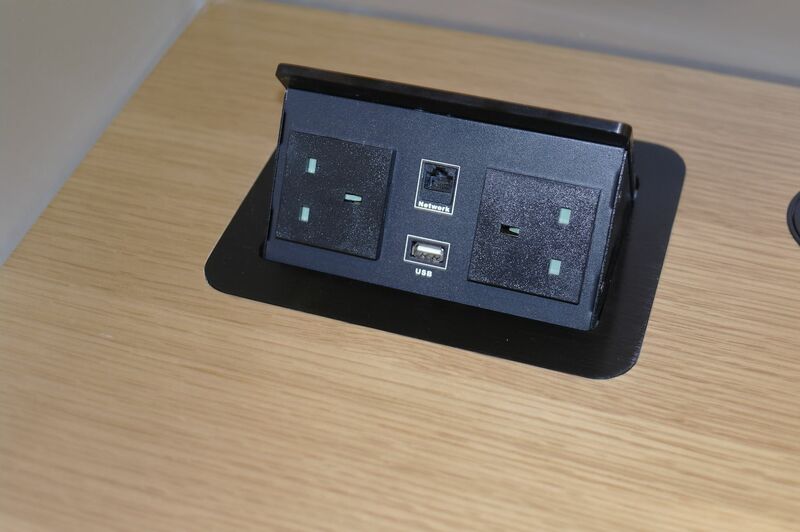 And to save you asking why these are Hong Kong-style power sockets instead of universal sockets which can handle a variety of plugs, the fire and safety regulations for the airport decree that only local power sockets can be installed. 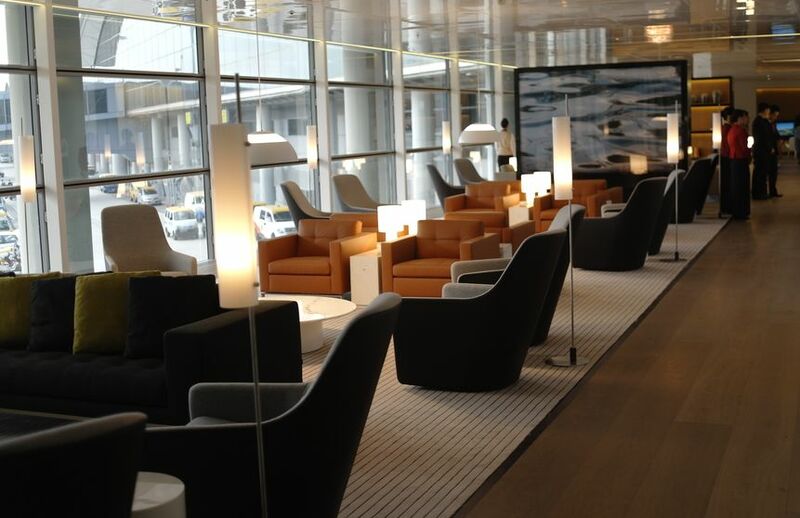 The Bridge has only a handful of Cathay's Solus chairs, and those appear more to divide each wing's stretch of 'living room' space from beverage areas such as The Long Bar and The Coffee Loft. It's a smart move, because the Solus chair says 'work' more than 'home'. So they're there for people who want them, but they don't dominate The Bridge and detract from its homey character. 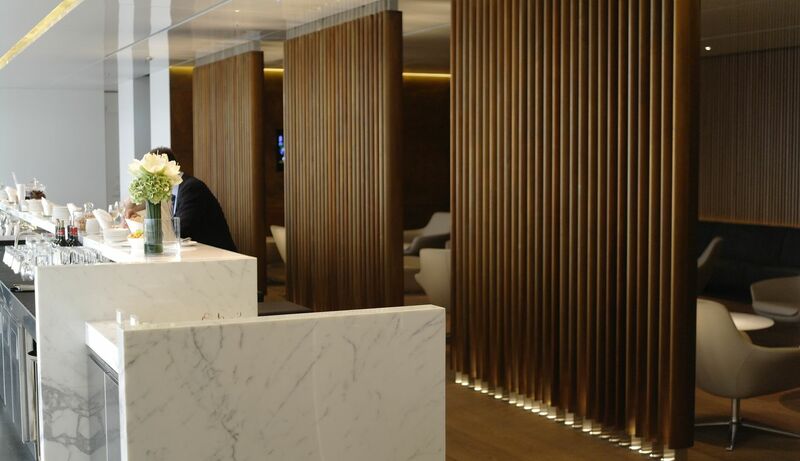 The Bridge is open to First and Business Class passengers, Silver or above Marco Polo Club members, and Sapphire or above oneworld members departing or transiting in Hong Kong. 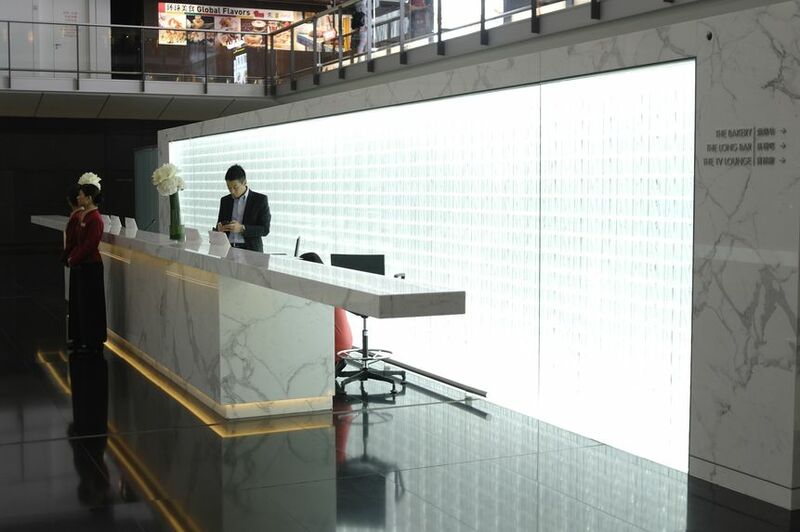 Opening hours are from 5:30am until the last departure. 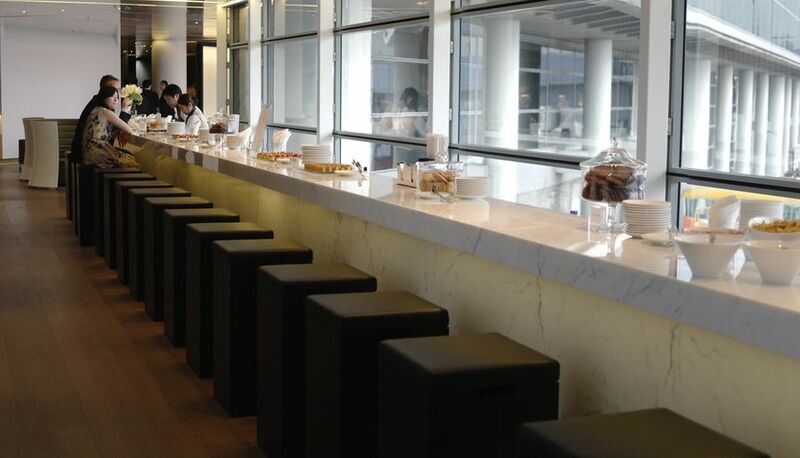 Note that The Pier First Class lounge, which is also located at this end of Hong Kong airport, has now been closed for extensive renovations and won't re-open until the first quarter of 2015. 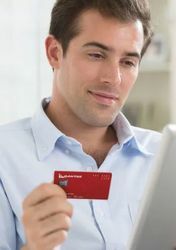 Read our story for all the details. 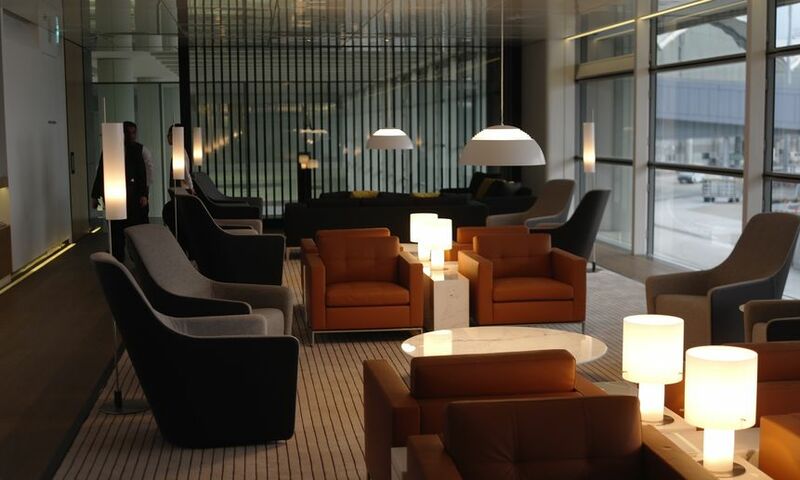 Australian Business Traveller is visiting Hong Kong to attend the opening of The Bridge as a guest of Cathay Pacific. Look superb. 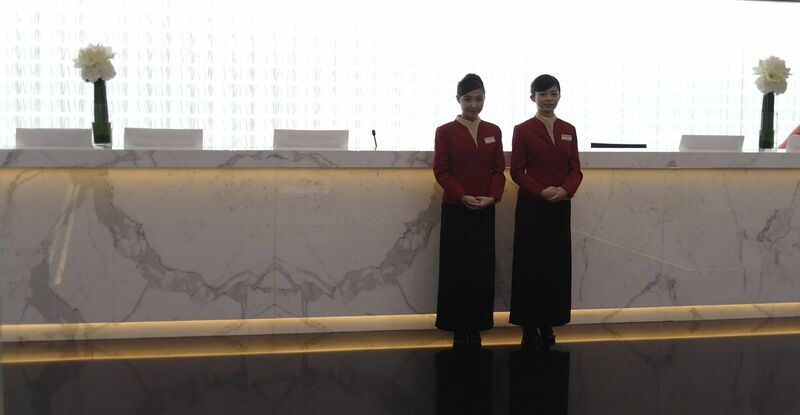 A great addition to the already seemless and brilliant HKIA. My first though halfway through was no solus chairs!! Darned fire regulations.... Particularly when a properly regulated plus would be a lot safer than the $2 adapter someone else shoves in there. Looks very nice... I'll have to give it a try next month! Could not agree more tabs. 90% of what they've done is great, and then they spoil it with 'The Bakery' which looks like the place I sat in to eat my Uni lunches 30 years ago. 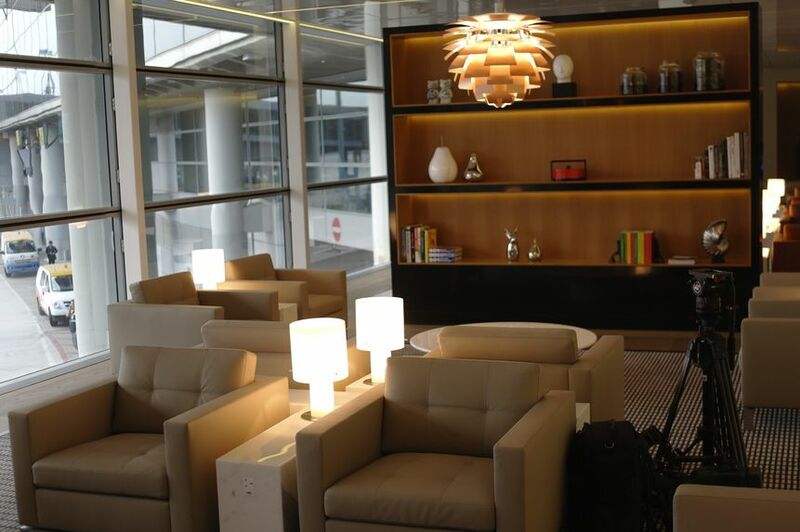 Very nice, however, correct me if I'm wrong, CX only has one First class lounge as of now, whilst having 3 business class lounges? 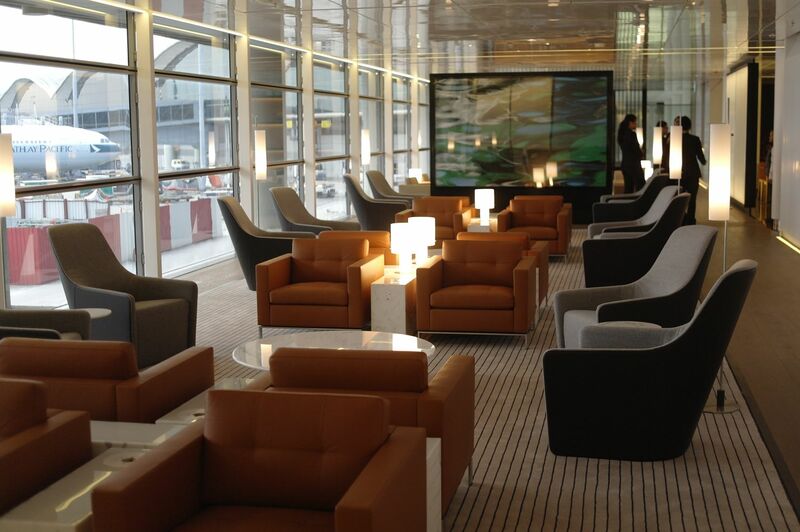 Hopefully the Wing F class lounge will not get too crowded now that the Pier F class lounge is closed til 2015. A bit disappointing they use iMacs as "work" stations. Never liked the Mac keyboard at all, and don't want to deal with a virtual machine or figuring out whatever configuration they're using for Windows (and questionably what version of Windows). It's likely I'll just tug along my Surface Pro 2 anyway, but it's nice to have access to a desktop with a big screen, though ideally natively running an operating system most businesses and enterprises use...if I really wanted media work or developing iOS apps, I'm certain I would do it anywhere but at HKIA. 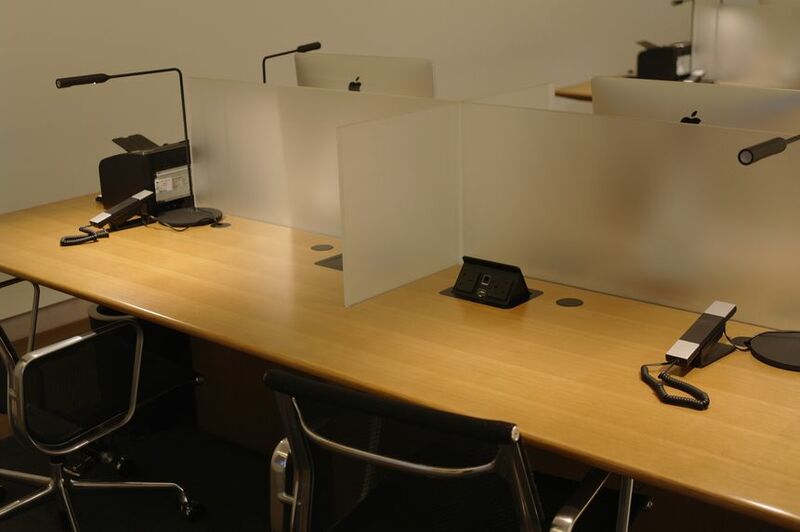 "Plus an IT Zone with 12 workstations: six are dual-boot iMacs set up to run both Windows and Mac OS X." Given there are 12 W/S and all will support Windows then you can't get any more. 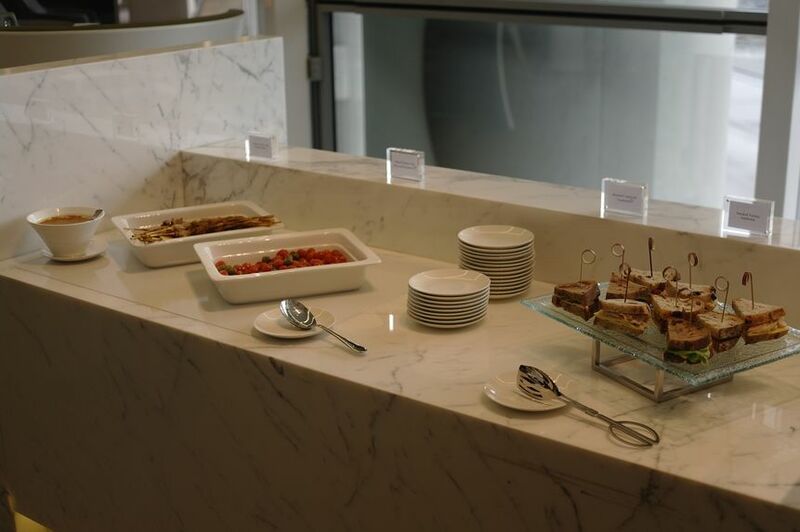 Comment on "Photo tour: Cathay Pacific's new The Bridge lounge at Hong Kong"